As preview information, and to convey the idea of the installation that Wilson Díaz will present at the daadgalerie in Berlin, we show some photos of an earlier version exhibited in 2015 at the MDE15 in Medellín, Colombia. Born in 1963, in a coca-growing region of rural Colombia, Wilson Díaz grew up in close proximity to the armed conflict that has dominated the country’s political stage—and visual culture—for over half a century. Based in Cali since the mid-1990s, he has utilized painting, performance, installation, and video to explore the tangled web of Colombian history and its constantly shifting protagonists and ideological positions. Indeed, his vast, eclectic body of work approximates the practice of visual art making to that of cultural history writing with its refusal of epic, linear narratives promising resolution and progress. In a series of documentary-style videos made with a cheap, hand-held video camera while visiting a demilitarized region of southern Colombia during the (failed) 1999–2002 peace talks, Díaz recorded the daily, leisure time activities of guerilla soldiers, representing them in an empathetic manner that contrasts with more conventional media caricatures of a one-dimensional, absolute enemy. Baño en el cañito, 2000, voyeuristically shows two adolescent boys quietly bathing in a stream, then carefully grooming and dressing themselves in their camouflage while Los rebeldes del sur, 2002, documents a concert by Julian Conrado y los compañeros: a FARC band whose lead singer was a rising vallenato star before joining the revolution. Although typically associated with love and heartbreak, vallenato has long been a musical genre that articulates the daily struggles of rural people, thus functioning as a subtle form of popular protest. It is also intricately connected to the culture of drug trafficking but perhaps, most importantly, has become an important symbol of nationalistic pride and self-definition. A subsequent body of work further elaborates upon the role of popular music in configuring a political subject and discourse. 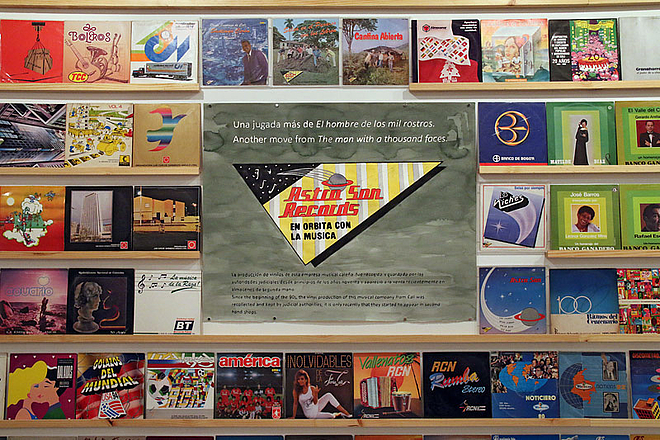 Several works depart from Díaz’s massive LP collection, including singles recorded by well-known musicians for presidential campaigns between 1970 and 1998 and albums whose cover art represent a gangster/guerilla aesthetic product of both the U.S. film industry and the Cuban Revolution. The installation Quimera, 2015, utilizes album cover art spanning several decades to narrate a cultural history of how government institutions, private corporations, the guerilla, and even the cartels wielded their economic interests and ideological positions through popular cultural forms. The most recent edition of the project Quimera was conceived for an exhibition at the museo Tamayo in Mexico City this year. An adapted version of the project is presented at the daadgalerie under the English title Chimera. During the art week, Díaz will discuss aspects of Columbia’s (pop-)musical and political culture in a lecture-performance. * 1963 Pitalito, Huila, Colombia. 16 October - 14 November 2014, Galería Santa Fe, Bogotá. Retrospective, with works since 1988. Curators: Camilo Ordóñez Robayo, María Sol Barón Pino.